Slovenia’s Elan Yachts has been on a roll these last few years, introducing a number of new models designed by Briton Rob Humphreys. The latest is the Elan GT5, an interesting 43-footer that brings a fresh approach to the performance cruising genre. Based on the beamy, hard-chined, twin-ruddered hull of the sporty Elan E5 and carrying a generous sailplan, the GT5 will have plenty of zip, but it’s the accommodations and deck plan that make it stand out from the crowd. The standard cockpit is long, wide and well designed, with long benches and high coamings forward providing extra lounging comfort. Tick a few boxes on the options sheet and you can also have twin tables, a convertible sunbed, a barbecue, fridge and wet bar all built in—the same features usually only found on boats 10ft longer. Belowdecks, light streams in through the tinted wraparound windows that have opening hatches and portlights set into them for ventilation. The galley-forward design, another big-boat feature, puts the saloon seating closer to the action in the cockpit. Layout options include two or three cabins and one or two heads. The GT5 will make its U.S. debut at the Newport and Annapolis shows this coming fall. 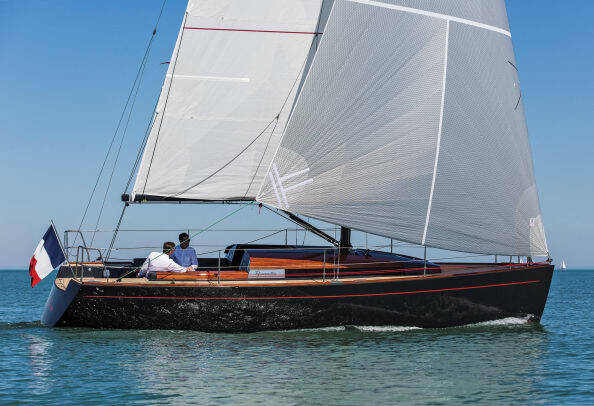 Meanwhile, Ohio-based Tartan Yachts has also come up with a new model that offers a distinctive layout combined with good sailing abilities. The Custom 37 Deck House Sloop is designer Tim Jackett’s take on the modern motorsailer—a couple’s boat that will cruise at 8-plus knots under power and also offer sprightly performance under sail. The Custom 37’s focal point is the bold deckhouse, from which the seated occupants will enjoy a panoramic view of their surroundings. The well-appointed, galley, head/shower and large island double berth occupy an open-plan “studio” style layout forward of the mast. Guests will be put up on the saloon settees. There are twin helms in the cockpit, which boasts a comfortable-looking wraparound seat, and when things get wet or rough the crew can retreat to the comfort of the interior helm station. With the optional beavertail keel drawing some 18in less than the 6ft 5in standard fin, the Custom 37 looks an ideal ICW cruiser. Hull #1 is already under construction. In the ranks of gorgeous daysailers, France’s shapely Tofinous are real head-turners with their svelte lines and rich brightwork. Launched late last year, the newest model is the Tofinou 10.c, which combines stunning good looks with comfortable accommodations. The Joubert-Nivelt design carries proportionately higher freeboard than its stablemates, along with a more pronounced cabintop, in order to gain stooping—rather than crouching—headroom down below. Beam is also wider than it would be if the boat were a pure daysailer with no need for accommodations. With this increase in volume comes a comfortable open-plan interior that incorporates cruising essentials such as a functional galley, head/shower and two double berths. It should be more than adequate for a couple or young family for a week or two of cruising. First-class moldings and lavish teak and mahogany trim combine for a classy look both above and below deck, while the powerful but easily handled sailplan will reward the kind of sailing enthusiast who will buy such a boat.